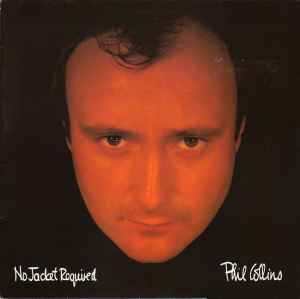 The third solo studio album by Phil Collins. The album was released on 25 January 1985 on Virgin (UK and Ireland), Atlantic (U.S. and Canada), and WEA (Rest of the world). "One More Night", "Sussudio", "Don't Lose My Number", and "Take Me Home" were all released as singles, with corresponding music videos. All four singles were top ten hits on the Billboard Hot 100 chart, with "Sussudio" and "One More Night" reaching number one. The three singles that were released in the UK all reached the top 20 on the UK charts. Worldwide, the album has sold over 25 million copies. The title was inspired by Mr. Collins refusal to Chicago's posh "Pump Room" at the Ambassador East Hotel. The 5 star legendary restaurant has a strict "no-jacket" no admittance policy. The original album LP from the UK, contains ten songs. The additional song "We Said Hello Goodbye" is only available on the CD edition. Really solid remaster. No surface noise on my pressing. Lots of range. Best this album has ever sounded, coming from a long time Phil Collins fan. I also dig the matte jacket, nice touch. My item : on labels BIEM is written in capitals. Somebody know if this press is same original master or is remixed edition?, only change the cover? Same recorded version? GOOD quality of record. German made... sound very nice. you will enjoy at the evening time. My favourite Phil Collins album. This was played so much in the Eighties everywhere - it's amazing how many people were infatuated with the sound. The combination of the saturated drums, Motown inspired brass and punchy lyrics and melodies make this an unforgettable album. I kind of wish they would have let the cover be for this remaster. Records I got in 2012 by EllieF.